The Masters Group is a professional entertainment company dedicated to providing the ultimate in quality service. 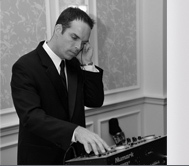 We've been providing world-class DJ entertainment for over 15 years. Whether your event is a first-class wedding, an exclusive private party, a corporate celebration, or an awards show such as the 2007 EMMY Awards, we can adapt to any theme or variety of people. We customize each event to fit your specific needs. By utilizing our Online Planning Tools, we plan your event from guest arrival to the last dance. Working from YOUR customized Playlist, we will play a unique blend of music, from traditional songs to the latest hits. We can be interactive or conservative. We always act as the consummate professional - classy but not stuffy, fun but never tacky. We have the acquired skill to "read the crowd" and get your guests of all ages involved in the fun. The Masters Group - Polished and professional entertainers that offer a world of experience and unique ideas to make weddings, corporate events, and personal celebrations come to life ensuring a memorable affair for everyone!